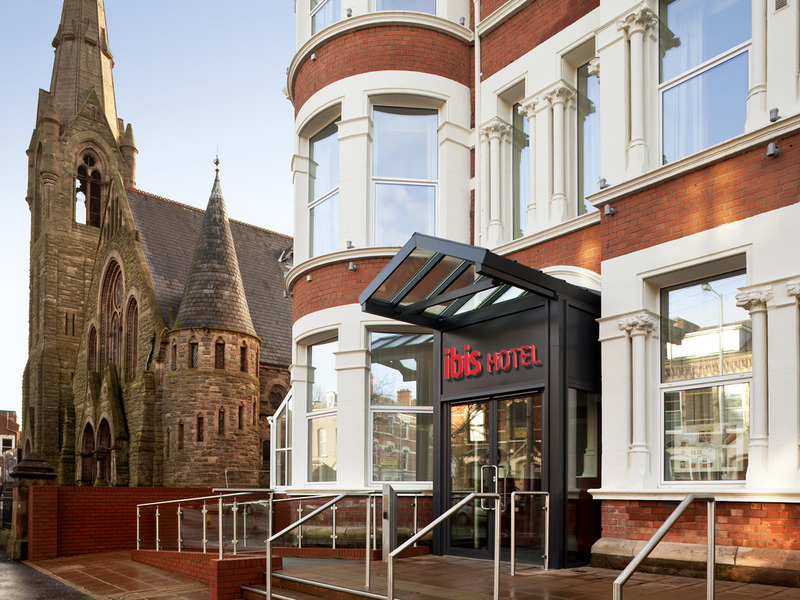 Beyond the bedrooms, ibis Belfast Queens Quarter ticks off everything you need in an affordable hotel: an on-site restaurant for daytime snacks and evening à la carte, a welcoming, 24hr lobby bar for enjoying a nightcap or two (we suggest indulging in a t asty local gin and getting competitive over a board game), and an unlimited, hearty breakfast spread every single morning. And it's all topped off with the warmest welcome from our friendly hotel staff. The hotel is just minutes from the restaurants, bars and cafés of Botanic Ave and Queens University and around 1km from the shopping and nightlife of Belfast city centre. The hotel has easy access to the M1, M2 and M3 motorways . Our location in a charming Area of Townscape Character is only 15 minutes' walk from the centre and a 10-minute drive across the River Lagan from the SSE Arena and Titanic Belfast, with Titanic Quarter Station easily accessed from nearby Botanic Station. Settle down for a lazy three-course dinner or simply indulge in a light lunchtime bite. Le Restaurant is open through the afternoon and into the evening for a laid-back à la carte dining experience in bright, modern surrounds. Clean warm and comfortable rooms, lovely breakfast and friendly helpful staff. Would definitely recommend. Very friendly staff with good personalities. Room good, bed excellent. This was our second stay at the hotel, having been in 2014. We would definitely come again. Please pass on our thanks to your friendly and efficient staff. I booked a twin room online but when we arrived the man said he only had 2 twin rooms left and he had to keep them for members so couldn't give us them unless we signed up. This is unacceptable as I'd expect to get what I have paid for. Signing up was free therefore I did it and got the room. We booked a non smoking room but our corridor was stinking of smoke which obviously came from other rooms that I assume are smoking rooms:these should be separate from non smoking. The shower temperature was fine but pressure was like drizzle. It was also noisy because we heard people next door and in the corridor. After using the bathroom smells lingered for a long time so ventilation is not good. Plus everything in the bathroom can be heard in the room which is not nice. The hotel is clean, breakfast is tasty, and the proximity to Queen's University was useful. The room was very clean, had tea/coffee facilities, nice comfy bed, good mirrors, bright and airy, good AC. Breakfast was nice, fair selection and nice breakfast area - Irish cooked breakfast, porridge, cereals, yogurt, fruit, coffee machine, toast with different breads, meats/cheeses, seeds/nuts/dried fruits. Since there were several of us traveling together we could all sit together for breakfast and vegan preferences were catered for as was one guest who forgot a toothbrush. The staff at reception were very friendly, assisted me in booking my taxi’s, accommodated my request to check out a little bit later than the normal time and the facilities like Air condition, Tv, shower, in the rooms were standard and worked very well. Cannot praise the staff enough. Friendly, welcoming, helpful. A pity they had to put up with an extremely rude, ill mannered guest! The hotel is fine and the staff friendly and helpful - however it would have been good to have had our room replenished (loo roll, towels, teabags etc) on our two night stay. Also, our particular room had a peculiar small of sulphur (rotten eggs) at times. Friendly staff, clean room and good food. We shall be back. Clean tidy and good value, good cleaning of rooms. Great area, ideally situated, very clean rooms. Good overall experience. The front desk and housekeeping staff were all good and service oriented. However, there are deep cleaning housekeeping issues in the rooms. See above Reception re-programmed the cards, then supplied new ones. Meanwhile me having to go from reception to Floor 6 numerous times Not good seeing I only stayed 2 nights Reception - Oh I'm sorry.........! Great staff made this a very enjoyable stay. Great location near the university and Botanic gardens as well as lots of nice bars and restaurants. Hotel was nice and quiet even though it was very well located. 24 hour service is great.